Why don’t people use paneer? This is a staple, people! It’s an un-ripened cheese made from milk. I used to make my own but for a few years I’ve been able to buy it at Wal-Mart and SuperStore. Now it’s gone. Gone because nobody eats it! Years ago, in my old life, I lived near a couple who ran an organic farm and kept milking cows. I would get a glass gallon jar of fresh, unpasteurized organic milk and make my own. I might take off a little thick cream that raised to the top but most of it I stirred back in for better flavour…… that was the best paneer ever. I couldn’t believe my eyes when I saw it, made by Nanak foods, in the SuperStore. I would buy two blocks for the same price it would cost me to make it. A block could be cut up into 4 portions and frozen. I would get two meals out of one portion so it lasted me for a couple of months. Start to caramalize onions (sautee if you’re in a hurry) and when they are half way done add cubed paneer. It needs onion and salt. I use it in stir-frys with rice or with any Italian dish. It’s even delicious in a toasted sandwich…… as long as it has onions. But now they stopped selling it. At first I was hoping it was just a missed order from Nanak foods but I’ve been to Sarnia and London twice and no paneer. I’m so sad. I’ve gotten so used to having it. I bought some tofu last week because I need the protein in my stir-frys. What a let-down: I’ve been spoiled by paneer. Tofu has no flavour, you have to add flavour…… I suspect it robs other foods of their flavour it’s so flavourless. Now it’s asparagus season. One of my favourite meals is paneer (sautéed with onions) and asparagus in a pita. Last night I made it with mozzarella. It was OK. I have to find a store in London that sells Indian foods and that means driving downtown….. curses! Tofu is so mainstream now….. I used to have to go to Chinatown to get it and they called it bean curd if you weren’t Chinese. Now everyone knows what tofu is, meat-eaters even use it sometimes, but nobody knows what paneer is! 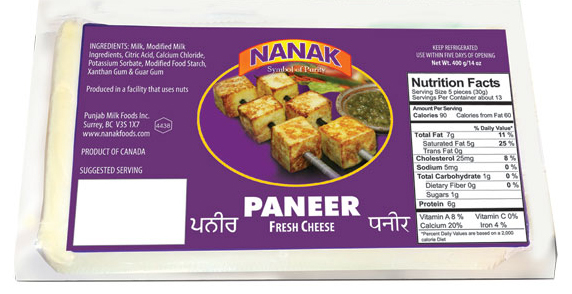 Canadians; go to your SuperStore or Wal-Mart and demand Nanak paneer! Please. Palak paneer is amazing! I haven’t seen it in stores… Is it in the dairy case? Or international food section? Yes, that’s like Saag Paneer, my favourite. That’s how I was introduced to paneer. It was in the dairy case along with cheese. Nanak foods sells good frozen entrees also so it’s worth looking for an Indian grocer. Have been making paneer for a while now. The result is much like haloumi, hard cheese from Cyprus, wich is easy to find in swedish grocery stores. I use it just like halloumi, brushed with oil and fry or grill it. Think it goes well in both savory and sweet dishes. Im writing a post on paneer soon to be published on my blog with the title “Oh cheesesus – fried cheese for desert” (the title is partly translated from swedish). I haven’t tried palak paneer yet. Do you have a good recipe? I did make it again, I missed it so much. It wasn’t very firm. and too much mess. I don’t make those fancy Indian dishes…. too much work and you really need to know the spices used. I just use it with my vegetables and rice or with Italian cooking.